After a month of being busy on Saturday mornings, I finally had this weekend free enough to hit a few yard sales. 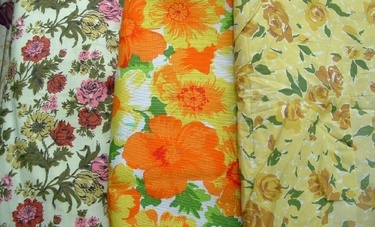 I was thrilled at the stash of vintage fabric I found at one sale. There was so much more that I left behind, and of course, being the greedy gal that I am, I'm so regretting not getting MORE! 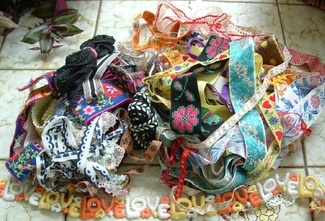 But here's what I did come home with, and most pieces are quite large-between 1 and 3 yards. I love all these kitchen-y themed prints. 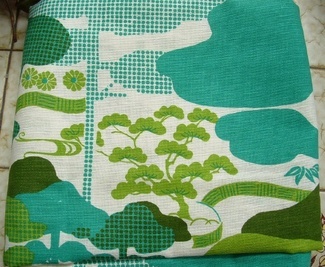 I would LOVE to use the blue one on the right for curtains, but I don't think I have enough. The black and white mod one on the left might be my favorite of all. I don't know what I'll dare to use it on! One of these needs to be a skirt, I think. This one's wild--it's a burlap sort of fabric. And of course, lots of ribbon! 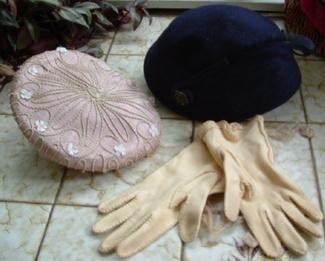 Some wonderful vintage hats and gloves for dress up. 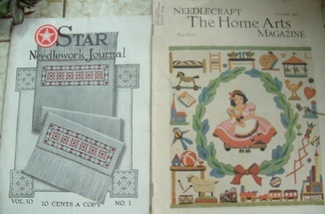 And two needlecraft magazines from 1933. So wonderful to look at! They each have needlework transfers included, too.